Every civilization has its big questions, those mysteries that have plagued generations of scholars. How did humanity rise from barbarism? Why did the gnomes leave the First World? Who are the string-pulling veiled masters? What is the Aucturn Enigma, and what strange powers did it grant the rulers of Osirion? What secret could be so great that it led to the suppression of volume five of the Pathfinder Chronicles? Within these covers, all these questions - and far more dangerous secrets - are explored at last. In-depth explorations of five of the most debated questions of the Pathfinder campaign setting, including the origins of life, the exodus of the gnomes, and the designs of the veiled masters. Insights into the workings and agendas of eight secret societies like the Anaphexia, the Esoteric Order of the Palatine Eye, and the Knights of the Ioun Star, as well as rules for joining their hidden ranks. Revelations on esoteric traditions such as astrology, numerology, spiritualism, and more, along with a host of new rules and character options to help integrate them into your game. Entirely new ways to divine and influence characters’ futures with Golarion’s zodiac, the Cosmic Caravan, as well as a system for using the harrow deck to inspire game-changing plot twists. Details on six of the most infamous texts in Golarion, along with the hidden powers that make them so dangerous. Numerous options for players, including new feats and spells, ritual magic items, the pain taster prestige class, the occult oracle mystery, and more. 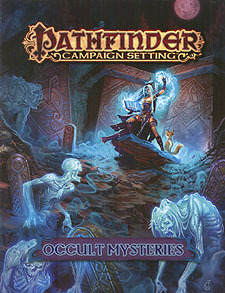 Occult Mysteries is intended for use with the Pathfinder Roleplaying Game and the Pathfinder campaign setting, but can easily be used in any fantasy game.